"High quality vinegar and oil will turn this leafy green salad into an Italian masterpiece. Preparation time is 20 minutes. This recipe is from The WEBB Cooks, articles and recipes by Robyn Webb, courtesy of the American Diabetes Association." 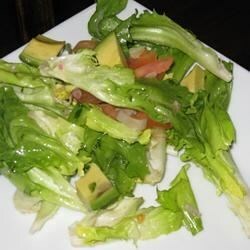 In a salad bowl, combine the escarole, romaine, bibb lettuce and tomatoes. Whisk together the vinegar, olive oil, cheese, garlic lemon juice, chicken broth and salt and pepper. Pour over salad, toss and serve. I don't know about this one. It had a strange taste to me. I think it was the chicken stock. I will try it again and substitute the chicken stock for dijon mustard. Very good, but added a little sugar to cut the acidity of the vinegar. Delicious...and low fat! Even my husband, who doesn't like vinegar-based salad dressings liked it. Great salad! I also added a cucamber, a carrot and some reduced fat feta cheese. Very good but use sparingly because too much ruins the flavour. I added green onion and red and green pepper slices. Makes ALOT of salad, but very good. I was very suprised by the dressing being so delish. Thanks for a great recipe!